If you are looking for a beard trimmer that is affordable but will be able to provide you with the style you want, this is going to be perfect for you. You should not have doubts about its service and quality because Geepas manufacturers high-quality products. You can use it for personal use to get the look you want. If you have bad experience with previous beard trimmers, do not give up. It will let you trim your facial hair any way you want and bring your confidence again to use this kind of devices. It comes with a stand which can be the perfect addition to your bathroom cabinet. It will not fall even when your hands are slippery and wet. It comes with user-friendly interface and sleek design for charge indication and length settings. The grip will fit your hands which makes maneuvering around you face easy and simple. It is rechargeable and you can use it as a cordless with full power. There are no options to vary the speed but you can use it to style your beard and moustache along with sideburns. It comes with 5 positions attachment comb. It has a LED light indicator. 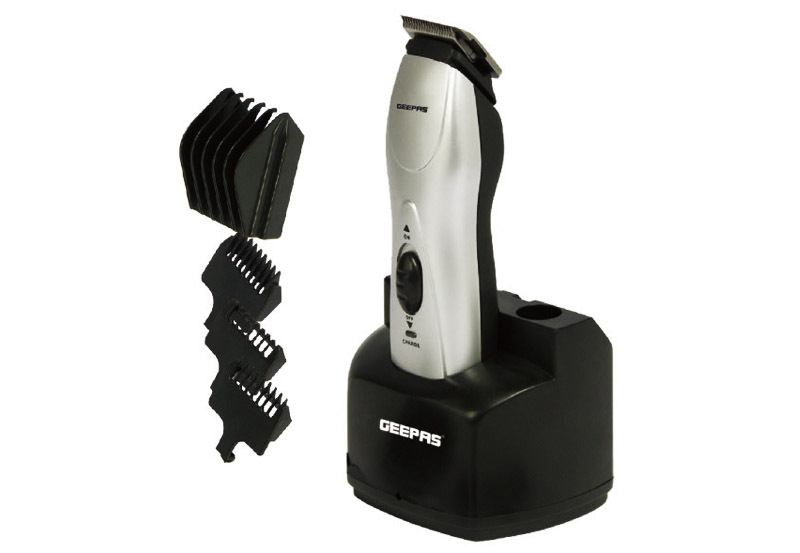 It is silver in color and looks better than many other beard trimmers in the market. The combs and the charging stand is black. It has the LED indicator light at the front part of the device and comes with a switch for turning it on or off. The size and shape makes it easy to hold. If you have a tight grip, you should loosen up or else you can hurt your skin because of the sharpness of the blades. If you are being too light, you will need to go over the same facial hair twice. It does not come in several colors unlike GTR 8291 which has a charging time of 3 hours and can operate for 40 minutes. It is better than the GTR 6252 which requires 8 hours of charging for just half an hour use. The bright side is that it comes with a cleaning brush and oil. This entry was posted in Geepas on January 2, 2018 by Professional Beard Trimmer Reviewer.